The Air Force’s top-secret space plane landed in California on Friday morning after nearly two years orbiting Earth on a classified mission. The robotic spacecraft’s purpose remains a mystery, though surveillance is a likely candidate. 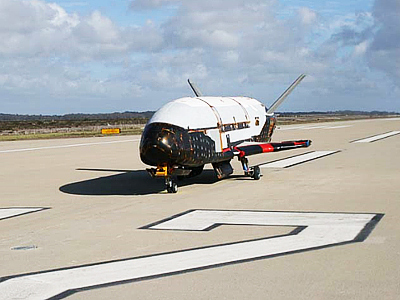 The Boeing X-37B Orbital Test Vehicle ‒ an unpiloted aircraft that looks like a miniature space shuttle ‒ made its third landing at Vandenberg Air Force Base in Southern California after spending more than 670 days in low-Earth orbit. The spacecraft was launched on December 11, 2012 by an Atlas V rocket from Cape Canaveral Air Force Station. It has since been flying in low-Earth orbit, performing whatever mission the Pentagon had prepared for its third test run. 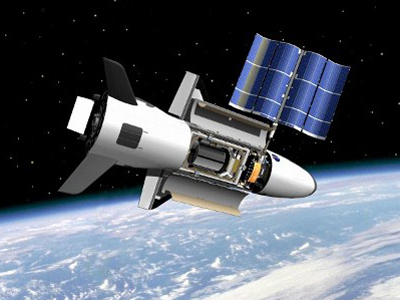 In March, X-37B broke its own space longevity record for staying in orbit. Its two previous rounds in space in 2010 and 2011-2012 lasted 225 and 469 days, respectively. This mission lasted a total of 674 days. A report by the IDG News Service earlier in 2014 suggested the trip’s mission was to test out the Air Force’s new space capabilities while also boosting the intelligence community’s surveillance capacity. 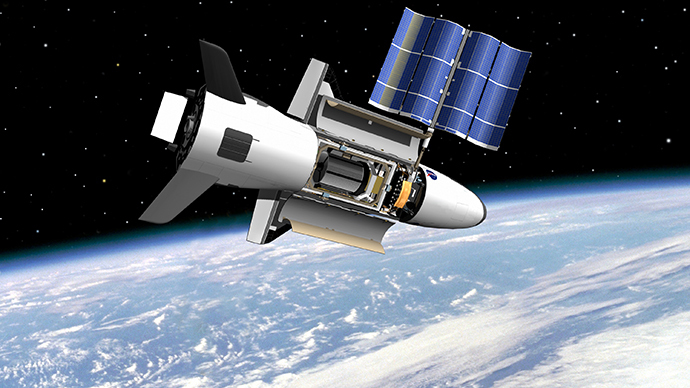 However details about X-37B missions ‒ including the payloads carried to orbit ‒ are officially classified, Space.com reported. Conventional theories from space and military enthusiasts believe the spacecraft will add additional reconnaissance capabilities to the US arsenal – either directly, or by deploying a small satellite from its cargo bay at a desired orbit. More sinister theories suggest that the vehicle may be weaponized and serve as a space counterpart to the Predator unmanned aerial vehicles. Some postulate that it could be used to attack and destroy adversaries’ satellites orbiting the Earth. 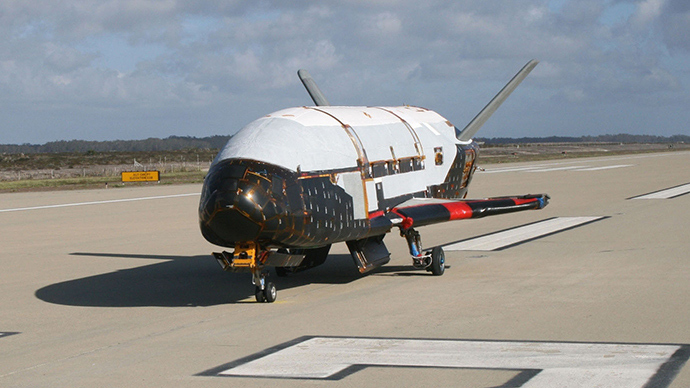 Others suspect that the X-37B might be used to transport troops to global hotspots within mere hours. The Air Force owns two of the solar-powered space planes built by Boeing’s Phantom Works. The spacecraft will call Florida’s Kennedy Space Center home, thanks to an agreement between the Air Force and NASA announced last Wednesday. 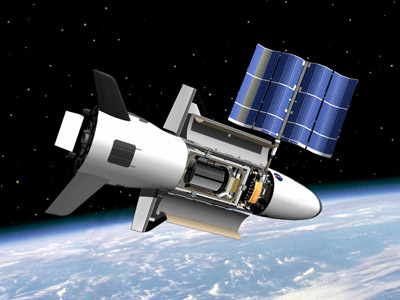 The X-37B will use the center’s Orbiter Processing Facility (OPF) Bays 1 and 2 to process the X-37B Orbital Test Vehicle for launch. The OPF bays have sat unused since the end of the Space Shuttle Program in August 2011. NASA expects to complete renovations on the two hangars by the end of the year, though painted blue doors on OPF-1 already tout it as "Home of the X-37B," marketing that is visible to passing tour buses, C4ISR & Networks reported. 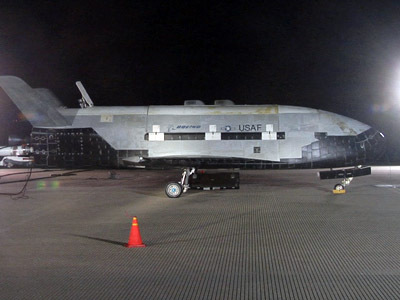 The X-37B is about 29 feet long by 9.5 feet tall (8.8 by 2.9 meters), with a wingspan of 15 feet (4.6 m) and a payload bay the size of a pickup-truck bed. Two X-37Bs could fit inside the payload bay of the space shuttle, which was 184 feet (56 m) long from nose to tail.